Designer provides multiple search actions located via Teiid Designer sub-menu in Eclipses Search menu. Search menu. 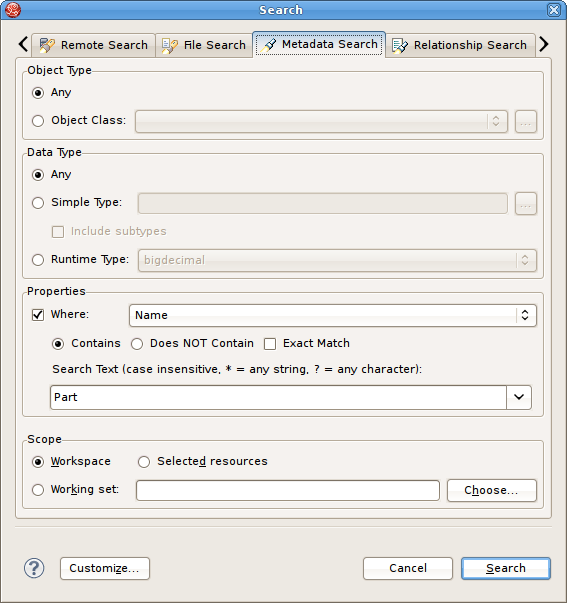 Relationship... - Launches the Search dialog and auto-selects the Relationships tab. User can search for models in the workspace by specifying a relationship type, participant locations, and/or names containing specified text. Search results appear in the Section 10.2.8, “Search Results View” view, and double-clicking a result will open that model in the appropriate editor. Transformations... - Launches the Transformation Search dialog. User can search models in the workspace for matching SQL text. 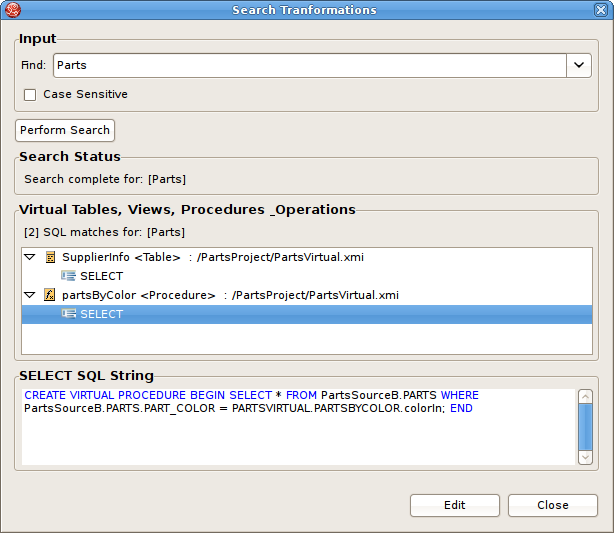 Search results appear in the dialog and user can select and view SQL as well as open desired transformations for editing. Metadata... - Launches the Search dialog. User can search for models in the workspace by specifying an Object Type, and/or a Data Type, and/or a property value. Search results appear in the Section 10.2.8, “Search Results View” view, and double-clicking a result will open that model in the appropriate editor. Find Model Object - Launches the Find Model Object dialog, which can be used to find an object in the workspace by specifying all or part of its name. Selecting the object will open it in the appropriate editor. The Teiid Designer provides a name-based search capability to quickly locate and display model objects. Step 1 - Open the Find Model Object dialog by either selecting the action on the main Teiid Designer tool-bar. or select the same action via the main menu's Search > Find Model Object action. Step 2 - Begin typing a word or partial word in the Type Object Name field. Wild-card (*) characters will be honored. 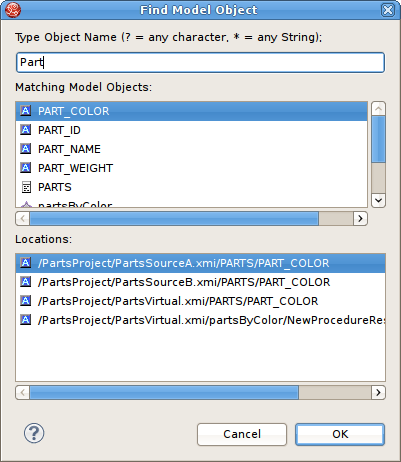 As you type, the objects which match the desired name will be displayed in the Matching Model Objects list. If there are more than one objects with the same name, the locations or paths of the objects are displayed in the Locations list. Step 3 - If more than one object exists with the desired name, select the one of the locations. Step 4 - Click OK. If editor is not open for the object's model, an editor will open. The desired object should end up displayed in a diagram (if applicable) and selected. 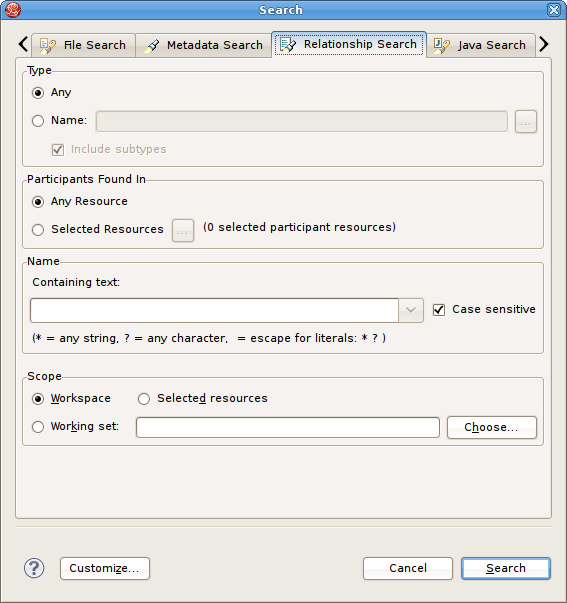 The Teiid Designer provides a search capability to find model objects that are characterized by one or more relationship property values including relationship type, participants and name. 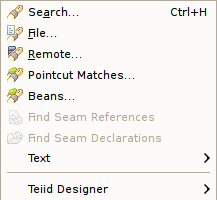 Step 1 - Select Search > Relationships... action on the Teiid Designer main menu which opens the Search dialog. Step 2 - Specify desired search options for Object Type, location of Participants and Name. Step 3 - Click Search. The search will be performed and the results will be displayed in the Section 10.2.8, “Search Results View”. If the view is not yet open, it will be opened automatically. The Teiid Designer provides a search capability to string values present in transformation SQL text. 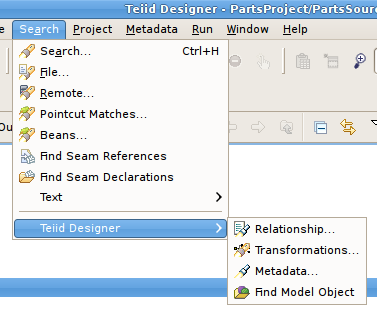 Step 1 - Select Search > Transformations... action on the Teiid Designer main menu which opens the Search Transformations dialog. Step 2 - Specify a string segment in the Find: field and specify/change your case sensitive preference. Step 3 - Select Perform Search button. Any transformation object containing SQL text which contains occurances of your string will be displayed in the results section. 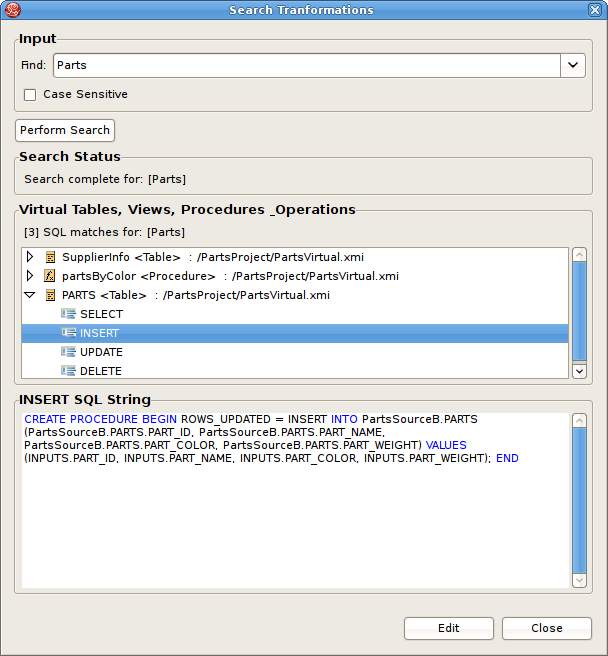 You can select individual objects and view the SQL. If a table or view supports updates and there is insert, update or delete SQL present, you can expand the object and select the individual SQL type as shown below. If you wish to view the selected object and its SQL in a Model Editor, you can click the Edit button. An editor will be opened if not already open. If an editor is open its tab will be selected. In addition, the Transformation Editor will be opened and you can perform Find/Replace (Ctrl-F) actions to highlight your original searched text string and edit your SQL if you wish. The Teiid Designer provides a search capability to find model objects that are characterized by one or more metadata property values. Step 1 - Select Search > Metadata... action on the main Teiid Designer toolbar which opens the Search dialog. Step 2 - Specify desired search options for Object Type, Data Type and Properties.